The final production in the 2015-2016 Season will be the Southeastern Premiere of HAND TO GOD by Robert Askins (tickets on sale July 30) running Oct 1-30. This hysterical and provocative new comedy was hailed by the New York Times as “ferociously funny” and the New York Daily News called it “irreverent, raunchy and bound to leave you sore from laughing!” STALKING THE BOGEYMAN adapted by Markus Potter and David Holthouse will now be running Jul 30-Aug 28. I’M GONNA PRAY FOR YOU SO HARD by Halley Feiffer will be shifted to a future season. 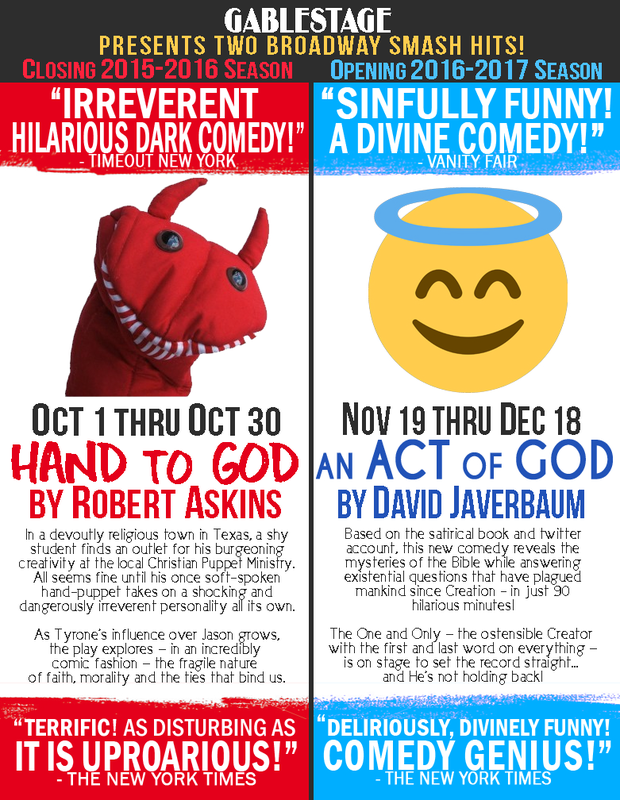 Our exciting 19th Season opens with David Javerbaum’s AN ACT OF GOD running Nov 19-Dec 18. Based on the satirical book and twitter account, this new comedy reveals the mysteries of the Bible while answering existential questions that have plagued mankind since Creation – in just 90 minutes. Additionally, BETWEEN RIVERSIDE AND CRAZY by Stephen Adly Guirgis will have its Southeastern Premiere from Jan 21-Feb 19. As the 2015 Winner of the PULITZER PRIZE for DRAMA this new play was labeled by Newsday as a “smart, exuberantly funny urban dramedy with a spirit as shrewd and forgiving as its motormouth language is wild and lush!” Four additional plays are currently in negotiation. Subscriptions are on sale now and can be purchased online or by calling the GableStage Box Office at 305-445-1119. NOTE: Renewal Subscriptions, if purchases prior to June 30, include an additional ticket to bring a guest to the theatre or attend a show multiple times. 7 total tickets for the season! This is a savings of $188! Subscribers receive preferred seating, easy exchange and cancellation with 24 hrs. notice, no additional fees, flexible ticketing, $5 off additional ticket purchases, and discounts on special events.